“The detachment you can feel throughout our younger records is gone. We felt like it was time to make a bigger, more generous statement.” When describing the new album, Heaven, the Walkmen lead singer Hamilton Leithauser portrays a band hitting maturity, comfortable in its mastery, after a decade together. Adds guitarist Paul Maroon, “when you’re starting out, you’re sitting there trying to come up with a big idea, but after a while, you learn about the process of writing. You learn about your friends in the band and how they work best.” It’s been ten years since the Walkmen made their debut album, Everybody Who Pretended To Like Me Is Gone. Ten years since they mixed the lovingly recorded analogue tapes down to the cheapest CD burner they could find. Ten years since lead singer Hamilton Leithauser snapped guitarist Paul Maroon’s arm in a celebratory wrestling match. Ten years since critics attached them to a New York scene they never wanted any part of. But when Leithauser sings “We Can’t Be Beat,” on the opening track of their new album, he means it, like Cool Hand Luke getting up off the floor for one more round. “The world is ours,” he declares. This time, he may be right. This spring, the band played a series of 10th anniversary shows that demonstrated how far they have outstripped their peers: two sets over two hours, no filler, rapturously received. In contrast, fellow graduates from New York’s celebrated rock revival class of ’02 have burned out or faded from view. The Walkmen are the great New York band of their generation, and in Heaven, they have delivered their third killer album in a row. Although Leithauser argues that “our biggest accomplishment is just being here,” they are making the best music of their career and filling their largest venues yet. Their spot at the top of the bill at May’s Crossing Brooklyn Ferry festival, curated by The National, demonstrates the respect in which they are held by the current wave of bands making music in the city. “In The New Year”, a standout track on their fourth record, You & Me, implies that at one point there was pressure to quit: “My friends and my family, they are asking of me, how long will you ramble, how long will you still repeat?” Lauded as a stunning collection of songs, beautifully arranged, the 2008 album revitalized their career. Lisbon, released two years later, confirmed that trajectory, winning five star reviews for its short stories and spare, Sun Records sound. The clanging tones of Paul Maroon’s Rickenbacker Capri 360 and Gretsch Streamliner set the 1950s mood, as Leithauser channelled Orbison and Sinatra, in all their melancholy defiance. 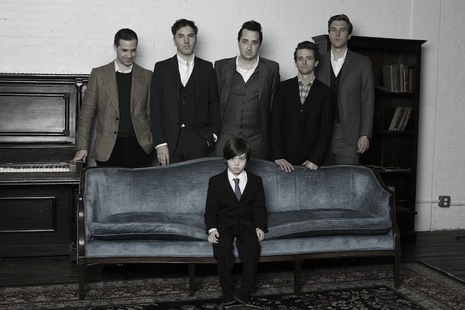 After 10 years, the Walkmen have everything that a great band needs. Leithauser is a mature singer of phenomenal stamina who can trade “The Rat’s” raw anger for the yearning of “Southern Heart” in a beat. Drummer Matt Barrick can pummel ferociously and drop down to Buddy Holly’s tramcar click. Bauer is a consummate sideman, effortlessly switching from guitar to farfisa to piano as required, or trading instruments with bass player Walter Martin, who has also written his most resonant lyrics yet. All five members of the band have kids now and if the impact of parenthood is hard to pin down in a single lyric, there is definitely a new openness and emotional honesty to the songs. Most importantly, the old gang mentality has deepened, becoming something worthwhile and lasting. “I’m very proud of what we’ve done. We’ve stayed friends and those friendships have grown,” says Bauer. “We have survival experience and real love that children generate in your life.” Heaven is a definitive statement of purpose and commitment, from a band at the peak of its powers that is finally winning the recognition it deserves.